“But…” I started to argue with him, but he interrupted me. “No,” he said. "There is no more Show. Period." At this point, I think I should apologise to my Beeloved Viewing Audience for my Editor cancelling my Show like that. I was really excited that, next week, my Guest was gonna bee a Firefly (aka “Lighting Bug”), but now, I have to call his People and give him the bad news. It’s highly sad, beecause I’m absolutely, completely certain that the Interview would have been Beelitzer Prize-Worthy. Probably. Anyway, I guess I’m out of a job. I guess, in some ways, I’m not too overly upset, though . . . I really didn’t like having to get up in the middle of the night, so at least now I can sleep in. This also means that I can finally take a long-awaited Vacation. 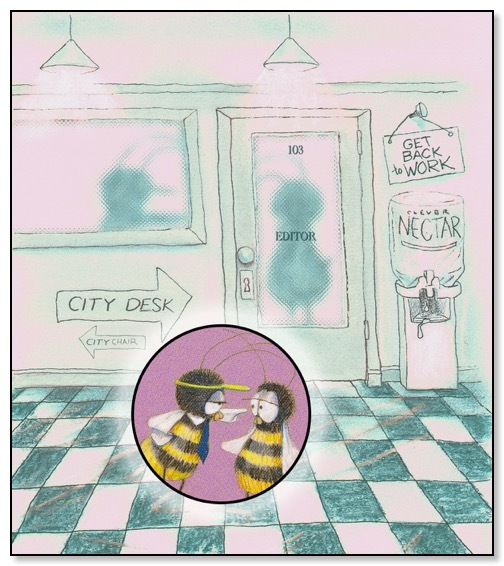 It IS still the Hot Season, so is there a better time for a bee to stop working and take some time off? Okay then! I’ll see everybody when I get back. Until then, let’s all bee careful out there!